One of the aims of the Woodland Heritage is to promote the good use of British Timber and "CHAIRS 2004" will highlight this aspect at their International Chairmakers Symposium. Three of the nine eminent speakers will give talks broadly along this very subject, and then the makers will be able to discuss the importance together later. Meanwhile all the delightfully different chairs of the 150 or so makers will make an outstanding exhibition for the public to enjoy. This is all taking place at The National Arboretum, Westonbirt, near Tetbury, Gloucestershire. May is a particularly attractive time of year to visit the Arboretum to see the fresh new leaves, flowering shrubs and the multitude of wild flowers. All the chairs in the exhibition will be amazingly different and the two illustrated show very different approaches to the use of English Hardwoods. The ‘Hurricane’ chair was inspired by the hurricane storms in 1987 when vast numbers of trees were blown over one dreadful night. Many different good things came out of that bad blow including the use by furniture designers and makers, Senior and Carmichael who live and work in Surrey where so many trees came down. They had the brilliant idea to design a chair made from about seven different woods to tremendous effect. Rather than detracting from the lovely, simple outline, the variety of timbers adds great interest to their special chair. Even in 2003 they are still able to utilise these precious timbers to make their ‘Hurricane’ chairs. 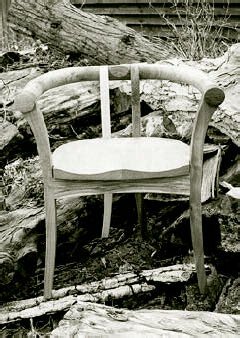 The chair owners must be able to test their friends and relations as they offer them a seat, about their knowledge of woods, even those well versed in different timbers must enjoy seeing them assembled in such a delightful way. "Pondlife" bench by Philip Koomen. The beautifully sculptured Pondlife bench made by Philip Koomen attracts observers to go and stroke the sinewy ‘reeds’ surrounding an inviting cedar wood seat. And having sat on it, the person is comfortably enveloped by the carved sweet chestnut fingers. Philip, who is one of the speakers at "CHAIRS 2004", says he became aware that we are not managing our own environment and natural resources responsibly after the Rio Summit in 1992. He believes that a balance between timber production and conservation is essential to good woodland management practice, and so tries to source his timber locally. Finding a market for neglected timber often produces inspiring pieces of furniture and he finds his clients are delighted to know that the piece has local provenance. The sweet chestnut ‘reeds’ are a point in case as those semi-matured stems would have been just waste, but with clever carving they make an outstanding garden or conservatory ornament. These are just two totally different chairs made from English hardwoods. Visitors will be able to delight in seeing wonderful examples of the use of good wood at "CHAIRS 2004" when we expect well over 100 on view for the public to admire and hopefully order in May. In previous editions of this Journal you will have noted articles about Gudrun Leitz, Tino Rawnsley and Ben Orford in their various roles. Gudrun is one of the Speakers at the Symposium bringing her depth of knowledge of the use of timber, not only for her own furniture, but also through teaching 100’s of pupils to make their own chairs. She has been a great inspiration to many, including young Ben Orford who is featured in another article in this Journal. Tino Rawnsley (who has also travelled in America) will bring a chair and his considerable knowledge and skills to the event. The "Hurricane" Chair by Senior & Carmichael. The exhibition of CHAIRS will be from NOON on Saturday 1st May - NOON on Monday 3rd of May when there will be an auction of CHAIRS starting with those from overseas. The normal charges for the Arboretum will be £6 per head but Members of Woodland Heritage may mention the W.H. at the entrance and their tickets will be £4. The Exhibitions are free, including the Marquee that will contain stands from Cheltenham Museum (showing local Arts & Crafts Chairs) and Wycombe Museum (showing early Windsors) and the Regional Furniture Society and local Cotswold Antique Dealers will exhibit other aspects of earlier Chairs.